The page list the Foundation's announcements, press releases, and opportunities. Please contact the foundation at contact@gglapa.org with any questions or comments about the information listed below. Greenville, South Carolina - The Alpha Phi Alpha Greenville Foundation (AGF) and Furman University continued our 11-year partnership by promoting oratorical skills with Greenville County High School Students, with the annual Joseph Vaughn Oratorical Contestant. (JVOC). Since 2008, AGF has sponsored the Joseph Vaughn Oratorial Competition and this year we again had five finalists compete in the event which was held at Tabernacle Baptist Church, on 400 S. Hudson Street in Greenville South Carolina. The contestants spoke on this year's theme, " Any law that degrades human personality is unjust. What my responsibility in today's society? ", which refers to the Martin Luther King's famous Letter from a Birmingham Jail written in April 1963. Contestants were required to give 4-7:30 minute speeches and were evaluated by a panel of four judges on the following areas: Content, Delivery, and Language. Prizes were as follows: 1st place -$450, 2nd place - $250, and third place -$150. All other finalists received a certificate and participation prize. Greenville, South Carolina - Born in 1936 in Hendersonville, North Carolina, Pearlie was the third of four children and the only girl. After the family moved into a log cabin in rural Saluda, North Carolina, Harris spent summers singing with the Billy Graham Crusade in Montreat. After high school, she attended Barber-Scotia College where she majored in education and landed her first job teaching fifth grade in Beaufort. It was there in 1960 she met her husband, a Marine drill instructor at Parris Island. In 1963, they moved to Greenville so Harris could care for her ailing mother. Both their sons were born here and reared in her husband's religion, which she confessed, is how she came to be a Catholic. In the Upstate, Harris taught at the Washington Middle School and then at Burgess Elementary. Both were segregated, she said. Later, Harris taught at Sara Collins Elementary and then in the gifted program. While working and raising her sons, she pursued a graduate degree, earning her master's from Furman University in 1983. After 37 years of teaching, she retired. She wanted to find a way to help her community and extend her personal mission of faith, help, and hope. And just days later, she said, she was drafted by a friend to be a volunteer at St. Francis, working first at the reception desk and then on the internal review board assessing clinical trials. She served as Eucharistic minister and on the St. Francis Foundation Board sharing her wisdom and community knowledge. 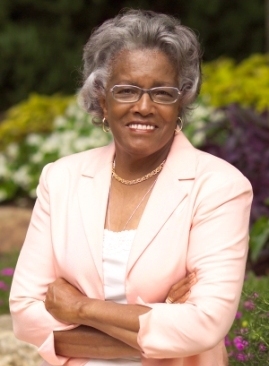 In 2009, she was approached to serve on the Board of Directors for St. Francis Health System where she became the first woman and the first ethnic person to serve as chair of the board. On October 20, 2011, a family that had a lot of history with St. Francis donated a building and named it The Pearlie Harris Center for Breast Health. Over the years, along with volunteering at St. Francis, Harris has served on the boards of the Urban League of the Upstate, the Greenville Symphony Guild, the Greenville Chorale and the Greenville County Museum of Art where she spent hundreds of hours at the museum as a docent, sharing her love of art with children. A congregant of St. Mary's Church in Mauldin, she's a member of the Catholic Fellowship and the South Carolina Council of Catholic Women Historians and was named the 2010 South Carolina State Catholic Woman of the Year. She has served as chair of the American Heart Association's Go Red campaign, a volunteer at the BMW Golf Tournament and a member of the St. Mary's School PTA. In addition to the vast support she has lent St. Francis, she has been instrumental in leading the Greenville Mardi Gras Gala, a signature event which raises thousands of dollars for critical needs throughout the Upstate; has served on the board of St. Joseph's High School for more than a decade; served two years as President of St. Mary's Woman's Club and has given leadership to various boards including Operation Shoe Horn. Currently, she is on the Board at Center Stage and Greenville County Museum of Art. She is the President of Unity Health on Main and vice president of the Greenville County Youth Orchestra. We are extremely proud to select Pearlie Harris as our 2019 Martin Luther King, Jr. Citizenship Award Winner. Please join us as we honor his work at the 2019 Martin Luther King, Jr. Scholarship Gala on January 13, 2019. Established in 2012 as a public 501(c)3 non-profit, tax-exempted organization, Alpha Phi Alpha Greenville Foundation's mission is to aid the poor and disadvantaged and help them toward a life of self-sufficiency. Our programs address teenage pregnancy prevention, college preparation & awareness, educational scholarships, youth leadership development, and other similar programs. We serve the Upstate area of South Carolina and are affiliated with the Gamma Gamma Lambda Chapter of ΑΦΑ in Greenville, South Carolina. Greenville, South Carolina - Alpha Phi Alpha Greenville Foundation (AGF) released its 2018 Annual Report which covered its programs from March 2017 to March 2018. This year, the foundation reached more than 430 students with its six (6) youth programs which include the Martin Luther King, Jr. Youth Program, Dr. Rudolph G. Gordon College Fair, Joseph Vaughn Oratorical Contest, Leadership Development & Citizenship Education Institute (LDCEI) and Project Alpha Program. Here are some highlights and follow ups from this year's report. Dr. Rudolph G. Gordon College Fair had a record number of student awards with 98 student winners and more than 250 people attending the program. That program held two seminars on Finanical Aid and First year of College at Furman University's Trone Student Center. The Martin Luther King, Jr. Youth Program awarded 264 MLK Youth Award to Greenville high schools through the Greenville County School District. AGF's LDCEI effort sent six high school students to Mississippi to participate with more than 200 students at Southern Regional event on the campus of Alcorn State University in June 2018. AGF and Gamma Gamma Lambda Chapter awarded the 2018 Luke H. Chatman Scholarship to Ms. Mckeena Johnson. AGF now supports four students with the scholarship. Joseph Vaughn Oratorical Contest had six orators and awarded $850 in student scholarships. The program was attended by more than 50 people at Springfield Baptist Church in Greenville. The Martin Luther King, Jr. Scholarship Gala had attendance of more than 250 people in January. The program continues to headline Greenville's Martin Luther King efforts and we celebrate our 10 year partnership with Furman University. 2018 Robert W. Anderson, Jr. Golf Outing was held at The Cliffs at Glassy had 32 golfers in June. Greenville, South Carolina - Alpha Phi Alpha Greenville Foundation and the Gamma Gamma Lambda Chapter of Alpha Phi Alpha Fraternity, Inc. are sponsoring their annual Project Alpha Seminar on July 14, 2018, at the Salvation Army's Kroc Center of Greenville, from 10 AM to 2 PM. Parents and young adult males between the age of 12-17 can attend and can register online by July 14, 2018. All attendees are required to have parental consent because of the frank nature of the discussions and topics that are discussed. Online registration participants should bring their tickets to the event. 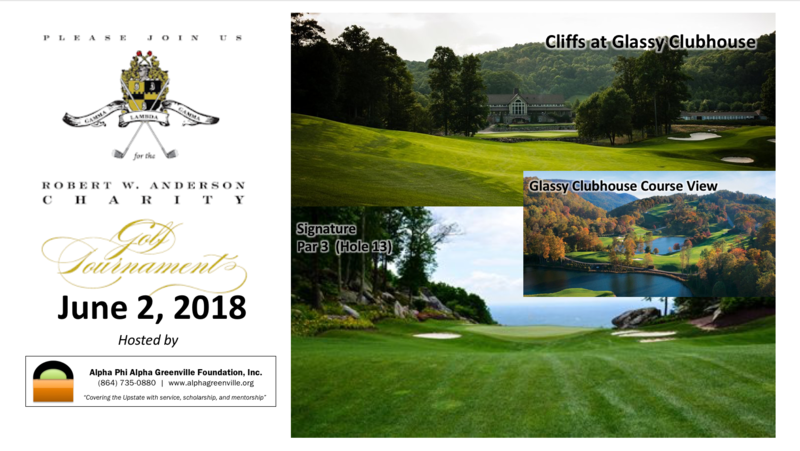 Greenville, South Carolina - Alpha Phi Alpha Greenville Foundation is sponsoring the Robert Anderson, Jr. Charity Golf Outing at the Cliffs at Glassey. The charity event will contribute to the Alpha Phi Alpha Fraternity Greenville Foundation as you join our members and other donors for an exclusive round of golf at the Cliffs at Glassy Golf Course. Greenville, South Carolina - The Alpha Phi Alpha Greenville Foundation was proud to continue is our 10-year partnership with Furman University to promote oratorical skills with High School Students in Greenville County, with the Joseph Vaughn Oratorical Contestant. (JVOC). Since 2008, AGF has sponsored the Joseph Vaughn Oratorial Competition and this year we had five finalists compete in the event which was held at Springfield Baptist Church, on McBee Avenue in Greenville South Carolina. Prizes were 1st place, $450, 2nd place, $250, and third place, $150. All other finalists received a certificate and participation prize. This competition is named in a honor of Mr. Joseph Vaughn, the first African-American student enrolled at Furman in 1965. Vaughn was a Greenville native and member of Omega Psi Phi Fraternity and was well known for his language and oratory skills. "He was a person who knew the English language and how to use it," said Chandra Dillard, Director of Community Relations at Furman. "You would often need to refer to a dictionary after hearing his speeches". Furman University commemorating 50 years of campus desegregation. Community volunteers served as judges and Upsilon Alpha Chapter, the local College Chapter of Alpha Phi Alpha at USC Upstate had roles as presiding host and tabulator during the event. Below are this year's winners and a list of all of the participants. Thank you to all of our contestants and their families as well as our great sponsors for the financial support they gave for this event. MLK Scholarship Gala Ticket available online now! Greenville, South Carolina - The Scholarship Gala is the oldest celebration of MLK Day in Greenville, SC; with the first event being held in 1977. It has been co-sponsored by Gamma Gamma Lambda Chapter of Alpha Phi Alpha Fraternity and Furman University since 2008. First, it serves as a lead event for the Gamma Gamma Lambda Chapter's and Furman University's community celebration of Dr. King's Legacy. Second, this is the primary fundraising effort for the Luke H. Chatman Scholarship, which is awarded to Greenville High School Students in April of each year. Third, the Gala serves as an opportunity to educate local youth about Dr. King’s Legacy and various programs that promote positive examples for youth to emulate. As a part of this effort, the Gala features in various presentations and information about Dr. King’s message and programs which are ideal examples his description of “Beloved Community”. Finally, the Gala is where we announce the latest award of the Martin Luther King Citizenship Award for Upstate of South Carolina. This year, Mr. Stacey J. Ashmore, Community Child Activist, has been selected as the 2018 Martin Luther King, Jr. Citizenship Award winner which was presented at Gala. In addition to presenting the winner of this year's award, the Gala is the longest held annual Commemorative event MLK Holiday for the Upstate and serves the culminating event for the Foundation's fundraising efforts. Greenville, South Carolina - If you are a champion for high risk and under privileged youth in the community, you’ve likely heard of Stacey Ashmore. Stacey has worked in our communities for more than 25 years with community patrol officers, helping to decrease gang activity, with his church, feeding, housing and clothing the homeless and in the Greenville Juvenile Detention Center, mentoring youth by "feeding" them both mentally and spiritually. Due to his exemplary commitment to community services, Stacey Ashmore has received many Outstanding Awards to include the “Max Heller Award”, Certificate of Appreciation for Mothers Raising Sons, “Fast Appreciation (Families and Schools Together)” and “Most Dedicated to the Cause Certificate of Excellence” by the Housing Authority of The City of Greenville. Stacey is a fun-loving husband, father, grand dad, sibling, and nephew and of great importance “Child Advocate”. He was born, educated, raised and lives in Greenville, SC. He attended Tuskegee University where he studied Physical Education and African American History. Stacey currently serves as the Community Outreach Coordinator at Greenville Family Partnership, where he continues to work with other organizations and churches to support positive youth initiatives for youth at risk and youth in the Greenville Juvenile Detention Center. We are extremely proud to select Stacey Ashmore as our 2018 Martin Luther King, Jr. Citizenship Award Winner. Please join us as we honor his work at the 2018 Martin Luther King, Jr. Scholarship Gala on January 7, 2018.